Parking can be a challenge even picking up a pizza on Chicago Avenue. So residents near Chicago and Winchester were skeptical about plans for a restaurant at that seats 364. 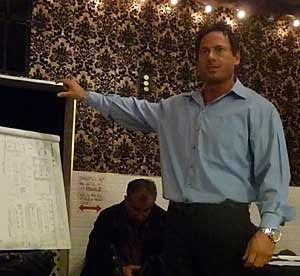 Developer Bill Loumbardias on April 3 submitted details on his restaurant proposal for at 1924 W. Chicago to the East Village Association’s planning committee. At the March 2 general meeting, members peppered Loumbardias with questions about the 5,500-square-foot dining hall and kitchen, and he has asked for another appearance to address their concerns. It would be the first restaurant for Loumbardias, who sells high-end used cars at Lakeshore Motorcars but is from a family involved with the Giordano's and Boston Blackie's chains. "The neighbors' fear is that after 9 at night you're going to turn into a cacophony of sound," said David J. Stumm Sr., a volunteer coordinator for the police beat there. While Loumbardias emphasized that the restaurant would not be a nightclub, he plans fundraising events in a private room and adjacent space seating 75. "My family is political," he explained. The April proposal from attorney Marino & Assoc. said the restaurant is not seeking an amusement license "at this time." Alley access would be tight and valets busy, residents said. They also asked where an exhaust stack could be located for minimal impact. The upper two stories facing Chicago Avenue would be residential, Loumbardias said. Raymond Valadez, chief of staff for Ald. Manuel Flores, said residential zoning along the alley would have to be waived. Past plans for the corner would have razed the building for condos. A bylaws change was ratified 19-2 to eliminate absentee voting. "There's something that's important about showing up and listening to a presentation," said Aaron Bilton, a past EVA president. Members set new EVA officers in place for 12 months, elevating Brodi Cole to treasurer and Dana Palmer as secretary and returned John Scheer and Greg Nagel as president and vice president. The new officers went right to work at the board meeting a week later. Planning chair Scott Rappe said the city had issued a demolition permit for St. Boniface Church but stated it was continuing to work with the Archdiocese of Chicago to find other uses for the church at 921 N. Noble St. The next membership meeting is Monday, April 6 in the Happy Village Tavern, at Thomas and Wolcott. The meeting is likely to include an update on the Wicker Park post office. The station chief canceled a scheduled March appearance. as long as it is not a Club, sounds great! It's on Chicago Ave. Parking is what it is. Once they have the license in hand, their promises will mean nothing. They will be able to have live music 7 nights a week, do anything their heart desires. Greatly needed. This area is weak. Hopefully the project is done nicely and the outdoor. I might actually like to eat around my area for once instead of having to drive elsewhere. For sure must! I don't understand the problem. We need this in our neighborhood. Actually, we need a lot. Great idea. Hopefully menu is strong. Wow I actually know Bill. Very good business mind and family. They will bring an excellent establishment to our needed community. I anticipate seeing him again at their opening. That is a nice corner. About 2 blocks west of my house. I hope they get a dog-friendly permit as well. Looking forward to their food and spirits selection. Glad to see progress during these hard times.